Continental Tyres Winners;Many motorists decide that they would like to fit Continental tyres on to their vehicles. Many motorists decide that they would like to fit Continental tyres on to their vehicles. These tyres are a popular choice for those people who live in the wetter areas of the UK. This is because this is just one of the many good points that we bestow on the brand of tyre made by Continental fitted to their vehicles as it has been proven to perform well in these weather conditions. A large number of accidents that have resulted in personal injury. So. have that happens when roads are very wet and slippery. You’ll also find that road accidents are twice as likely to happen. Of course, on the wet road too . Including another important factor ! not to forget is that most of these vehicles will be running on bald tyres. Because of these accidents. Drivers, tend to go for tyres that will keep them as safe as possible. Especially, during the bad weather. So, helping them to minimise the risk of being involved in an accident. It’s so important to make sure that you’re taking extra care. Especially, when driving in bad conditions Finding, that many people on the roads are driving. Consequently,without the correct tyres fitted to their vehicle. So, causes accidents. Because of the spray and through loss of visibility.Of course, the main danger is the risk of aquaplaning (Continental tyres are a great wet weather tyre). The cause for aquaplaning is a lair of water that forms between the tyre and the road and is then and this reduces your tyre’s grip and means that contact is lost with the road, the car could then go out of control causing an accident. The way that Continental Tyres have been designed. Of course, makes sure that they perform to their best ability. Most importantly, when the weather outside is very wet. Tyres works is to disperse as much water away from the road as possible . So,by using centre drainage channels and having many water dispersing “sipes” therefore they will successful increase the grip on the wet road. You’ll find that aquaplaning with this brand is at its minimal and dramatically decreased. It still worth remembering though that your Continental Tyres must be in good condition with a good tread area, a bald tyre whatever the make will be dangerous on all road conditions. Do not forget that the UK is traditionally a very wet country and also treats road safety as very important and although Continentals are an excellent brand any new tyre will be a thousand times better in all driving conditions than a “bald” tyre. 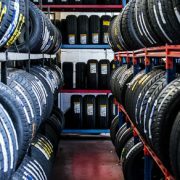 It is most important at all times of the year to have your tyres checked at regular intervals and always invest in a good make of tyres such as Continental tyres.